DEVONPORT Services’ hopes of securing runners-up spot in Western Counties West suffered a blow when they were beaten 37-28 by play-off rivals St Austell. Saints have now leapfrogged above Services and into second place in the table. They are one point ahead of Devonport with a game in hand. Services are now relying on them to slip up while knowing they need to win their final four games. Both clubs do have some tricky matches, with St Austell having three of the top five still to play and also tough trips to Falmouth and Crediton. “We’ve still got plenty of opportunities to get points and they (St Austell) have got plenty of opportunities to lose them,” said Services coach Mike Lewis. Services were left frustrated in Cornwall on Saturday, with nothing going their way on the afternoon. They were only one score behind in the closing stages but St Austell were awarded a late penalty, which they kicked to deny Services two bonus points. 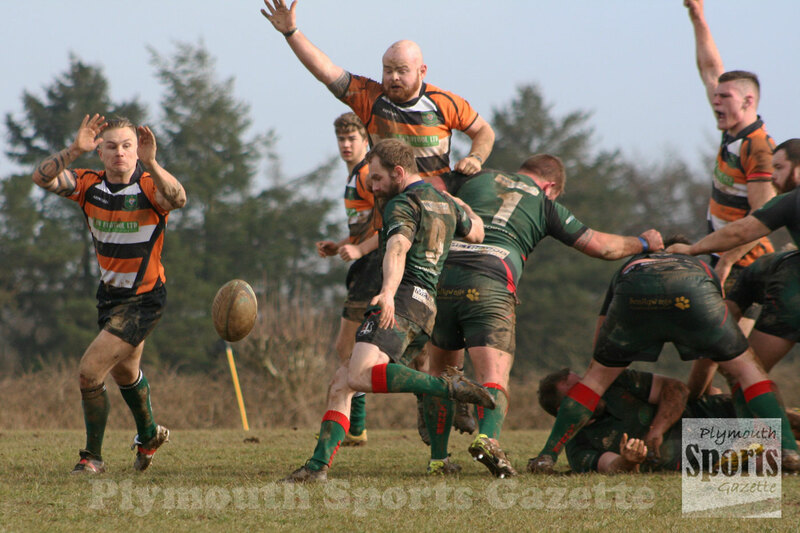 They did return back over the Tamar with one for scoring four tries – three of which came in the second half. “We were 20-odd points down at one point but we brought it back to within a score before everything seemed to go against us,” said Lewis. “We could have probably made some better decisions at times. Our line-out did not function very well, but the game could still have gone either way. “We got four tries and they kicked a late penalty, to take the extra bonus point away from us, which was frustrating. “But we did put in a valiant performance. Winger Ben McGowan scored their only try in the first half following a swift move from the line-out. Matt Anstis added the conversion. In the second half, Andy Pond ran in from 50 metres following an interception, before Joe Wyatt also crossed from an interception. Anstis scored the fourth try and also kicked the rest of their points. Ivybridge’s home South West Premier Division match against Bracknell was postponed. TITLE-chasing Saltash scored more than 80 points for the second time this season when they hammered relegation-threatened Hayle 87-14 at home. They will be able to join Wellington at the top of the table on Sunday if they claim a bonus-point win over second-from-bottom Torrington at Moorlands Lane. Torrington will be a slightly worried after seeing what the Ashes did to Hayle on Saturday. The hosts ran in 13 tries on a heavy pitch to claim their biggest win of the campaign. It was just five points better than their 82-14 away victory at Wessex earlier in the season. Five of their tries came in the opening 40 minutes. Two came from Cornwall back-row forward Lewis Wells, with fly-half Kieran Down, prop Adam Coutts and flanker Phil Eatwell getting the others. Down converted all-but one of those first half tries as Saltash led 33-7 at the interval. 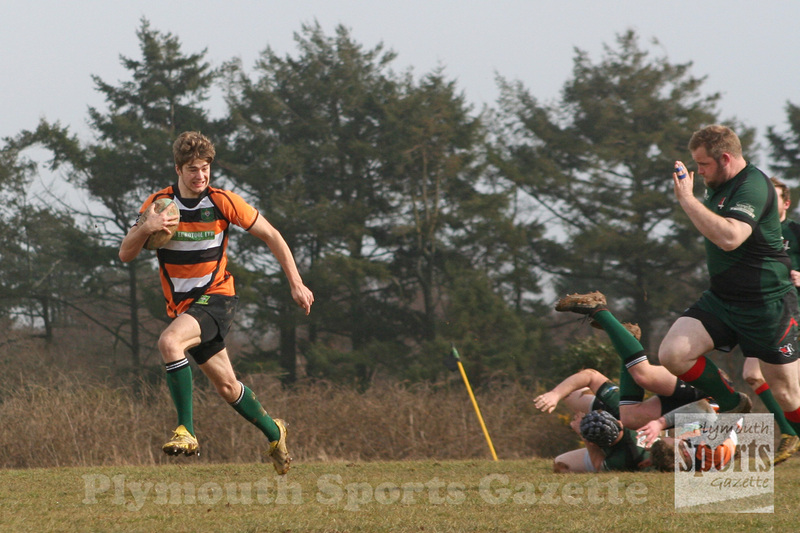 Number eight Tony Matthews scored Hayle’s only try in the opening period. The Ashes then ran riot in the second half. Greg Eatwell got them going again after the break before Wells completed his hat-trick and then Olly Mulberry crossed. The final quarter was totally one-way traffic. Wells added his fourth before Will Morton grabbed two. Greg Eatwell added his second before winger James Moriaty completed the scoring. 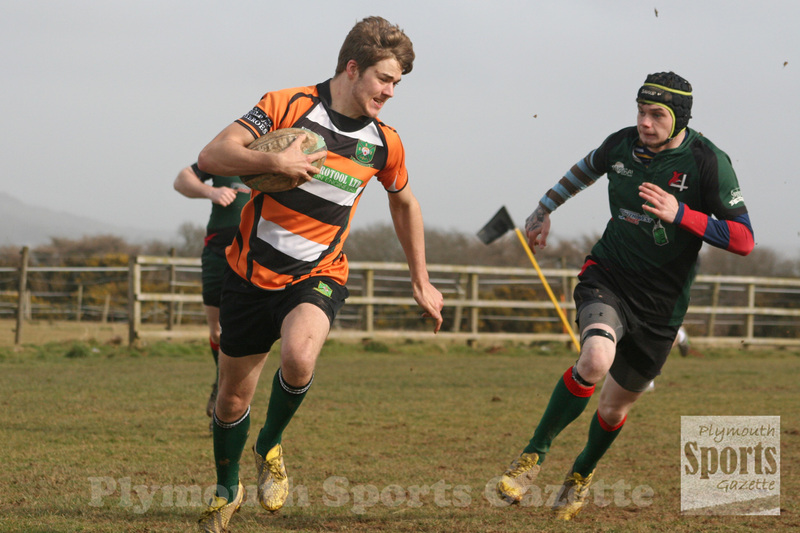 Hayle’s only points in the second half came from a converted try by Josh Bond. 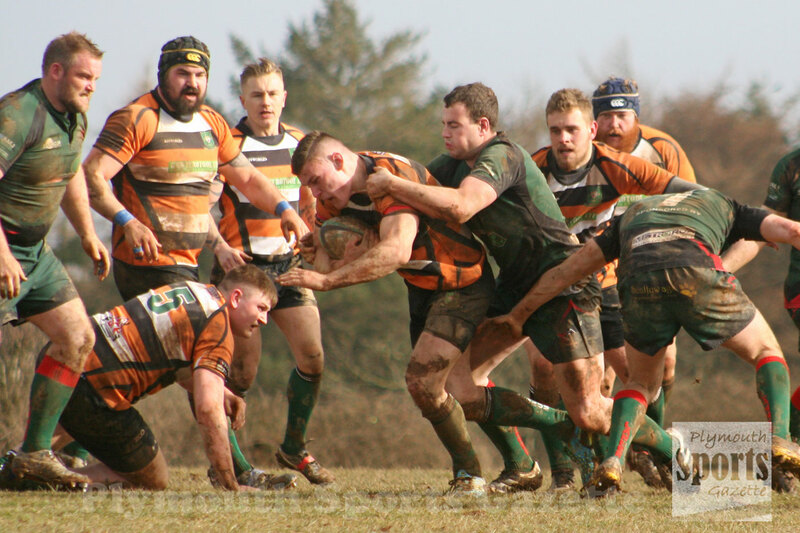 Plymouth Argaum had to make do with only a losing bonus point from their home match against bogey side Lanner. 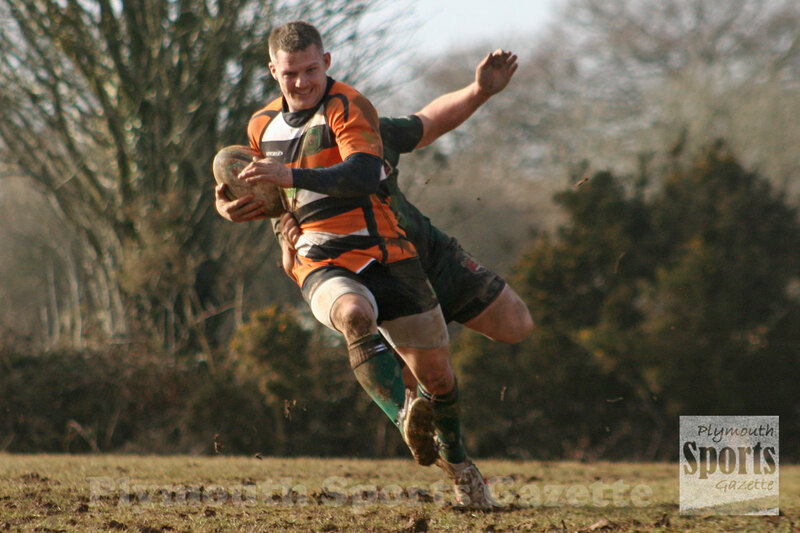 The Cornish club triumphed 18-13 at Bickleigh down to make it four wins in a row against Argaum. The hosts could not have asked for a better start, scoring after just 59 seconds. They gathered the kick-off and recycled well before Dan James made a break in the middle of the pitch before feeding winger Brian Williams, who ran in from 45 metres. Nick Prout and Al Murray both traded penalties to leave the score 8-3 in Argaum’s favour. It looked to be going well for the Plymouth side when the visitors were reduced to 14 men for 10 minutes on the quarter-of-an-hour mark. However, they didn’t really get in Lanner’s half while having a man advantage and the Cornish club gradually got on top in a stop-start affair. Lanner had two five-metre line-outs and four scrums on the line before they were awarded a penalty try on 33 minutes to put them 10-8 up, which was how it stayed until half-time. The visitors, who dominated the set-pieces, increased their lead to 15-8 six minutes after the interval when back Adam Harris was ruled to have got the ball down in the corner. Argaum struggled to win line-out ball all afternoon, which meant they did not really threaten until the end. That was after Lanner centre Prout had crucially kicked a penalty to put his side two scores up. In injury-time, Argaum finally found some attacking threat again and Calum Mills scored late on to set a nail-biting final few minutes, but Lanner were able to hang on. Afterwards Mills said: “They are a top-to-middle placed side in this league and they are well-drilled. But we worked really hard to get points back and got a losing bonus point. Argaum’s director of rugby Mark Sullivan added: “We were looking to take it from the set-piece, move the ball wide and then try and get around the corner. When we did that we looked really dangerous, but too often we got sucked back into the muddy grind, which is what they (Lanner) do well being a big side. “We didn’t play the ball quick enough and play to our strengths, but everybody worked hard. Ninth-placed Argaum stay above Tavistock, who gave top five side Bude a real run for their money before going down 24-15 at Sandy Park. Tavistock still have not won in 2018, but coach Hammy Kerswill was massively encouraged by their home display against Bude. Tavistock’s scrum was good against one of the league’s best set-piece sides, but they struggled with the line-out. Jack Easton scored two tries for Tavvy – one in the first half and one in the second, with replacement Tom Friend also crossing after coming on. Tavistock still were not able to play on their first team pitch due to the weather. Plymstock Albion Oaks’ home game against Honiton was postponed after the visitors’ players got stuck on the A30 following a serious coach fire which cause traffic chaos in east Devon. Tamar Saracens’ Devon One game at Totnes was also postponed. That was called off just 10 minutes before kick-off due to a waterlogged pitch. Saracens just need one win to secure their league status. They next match will now be this coming Saturday at home to Old Techs, who also have to win to have any chance of staying up. In Devon Two, DHSOB claimed their long-awaited first win of the season with a 32-12 win at St Columba & Torpoint. Despite only having 13 players to Saints’ 15, the Old Boys ran in five tries at Defiance Field to gain revenge for their 19-10 defeat earlier in the season. Ethan Hawkings, Matt Man and Jamie Brown claimed breakaway scores for DHSOB, while David Gardner and Peter Rushforth finished off well-worked forward plays. Man added two conversions and Lewis Jeffery kicked a penalty against a Saints side who finish bottom the table. In the Plymouth Combination Ellis Trophy, Devonport Services’ IIIs beat Plymouth Argaum 36-17, while University of Plymouth IVs overcome Plympton Victoria 33-3. The game involving Plym Vic did end early after they suffered four injuries, including one to points scorer Jordan Mitchell, who had to go to hospital with a damaged shoulder. “It was just one of those days,” said Plym Vic’s Chris Hunt, who has been on the sidelines for a number of weeks himself with a serious arm injury.